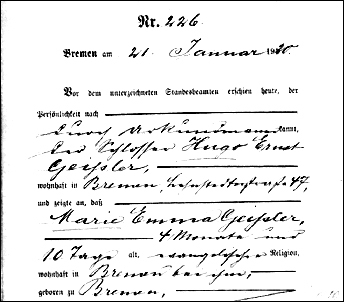 The first-born child of Hugo Ernst and Marie Margarethe (Nuckel) Geissler, Marie Emma Geissler should have provided The Legal Genealogist with all the cover for mischief that only an aunt can provide. She should have provided me with stories about all the mean things her little brother, my father, did to her while they were kids. She should have given me cousins who could share my love of wiener schnitzel as much as my cousins on the other side share my love of chicken-fried steak. She should have connected me to the history of our German ancestors and their customs and their ways. She should have shared with me our roots. But Marie Emma Geissler did none of those things. Instead, Marie Emma Geissler breathed her last 98 years ago today. She was, then, just four months and 10 days old. Marie’s parents, my paternal grandparents, were married on Valentine’s Day 1918 there in Bremen,1 where my grandmother’s family had lived for generations. Wedding photos show my grandfather tall and stern in his German Army uniform, and Marie radiant in her wedding gown and veil. This child, their first, was born almost exactly 19 months later, on 10 September 1919, there in Bremen, Germany.2 Her father was working as a locksmith at the time. Both of her parents were 28 years old. I imagine that Marie had blue eyes as her father and her brother did, though they might have gone on to darken with age to match her mother’s. I imagine that she was chubby and pink-cheeked and almost undoubtedly screamingly blonde. I imagine she was as fair as all her family members were. And I imagine that both of her parents thought the sun and the moon rose and set for that little girl. That she was loved and cherished and cared for. You are not forgotten, Marie Emma, despite your tragically short story. Let your legacy and memory continue. I spent most of yesterday documenting a little boy who was born prematurely on 21 Nov 1876. Little John Smith lived only 5 hours. I found his civil birth and death ledgers, his Roman Catholic baptism “at the moment of death,” and the burial register in the local Roman Catholic cemetery. Good for you. This is, as my friend Dave McDonald says and as Rick Fogarty reminded me, our sacred calling as genealogists: to tell these stories. My aunt Laura died at 7 years old in 1955 from a cerebral hemorrhage. My mom asked her parents if she could name her first born daughter Laura after her sister; that daughter is me. When I was younger, I never thought to ask my mom or grandparents much about aunt Laura. In 2016, I met a woman who lived in my grandparents’ neighborhood and was my aunt’s best friend for their first 7 years. It has been very special learning all about my aunt’s short life from her dear friend and now my friend too. This reminded me of my Swedish grandfather and his wife (not my grandmother) who departed Goteborg’s harbour on 9 July 1880 with their two children, both boys, aged 4 years old and 2 years old, respectively. There is no further mention of these two children after they arrived and settled in Marinette, Wisconsin. I have no proof, but I imagine they died on the voyage and were buried at sea, which was all too common. The couple did have two more children after arriving, and gave another son the same name as one of the two “lost” children. Thank you for another great article. This reminds me of my great uncle, Edward L. (probably Libero) Peretti. He was born 19 June 1888 on 51 Tileston St, Boston, MA to Libero Joseph and Annie F (Pattison) Peretti. He was the younger brother to my grandfather, Joseph Henry Peretti who was born the year before. He never lived to see his younger sister Lucretia C Peretti who was born in 1992. Edward only lived 5 short months. He died of murasmus ( a failure to thrive) on 24 December 1888 at his family’s home on 51 Tileston St, Boston. This must have been a devestating Christmas for his family. Though his life was short he will not be forgotten. I had quite a few young family members die. My maternal grandfather had a sister, Lucille, who died as a 10-year-old child from the Spanish flu epidemic of 1918. She died in late December and was buried 1 January 1919. I can’t even fathom what my great grandparents felt! In the probate court, I found birth register of four children my great-great grandparents had (to include my future great grandfather), but the three girls died from childhood diseases like whooping cough (they were recorded in the death register), but I found no death record for the boy, since he did not appear in the 1880 or 1900 census. The three girls are buried beside their parents. Such a poignant and bittersweet story. My husband’s father grew up a “single twin,” one of two little boys born to William L. and Sarah Howe Salyers on 14 May 1915. One of those boys, given the name of his Irish immigrant maternal great-grandfather John, was stillborn. The other, named David Hillis after his paternal great-grandfather, lived and thrived and eventually became my father-in-law. I knew about the “missing twin” but only recently located his death certificate. Your blog post today stirred up all the questions I have about what kind of man John would have become. wiener schnitzel! Oh my goodness, one deli/restaurant still serves it in downtown Salt Lake City. I’m sure you will try to hoof over by Trax for lunch at Siegfried’s (Mon-Wed, lunch only, Thurs-Sat, lunch and dinner). Always fresh done. Love it with fresh lemon squeeze. SLIG is at the Hilton — I can WALK to Siegfried’s!! My 3 great grandparents, (Ludwig) Augustin Bolinski and wife Marianna Polaszyk had to leave behind 3 children who died in infancy in Gebice, Poland (was Gebice, Czarnikau, Posen, Preussen at the time), for America, child-less on voyage. They were fortunate to have cabin with the captain instead of the steerage. Settled in Mukwa Township, in Waupaca Co Wisconsin and had 7 more children, first and last one died in infancy, but raised good family, the oldest adult went on to have 16 children, no twins, all grew to adulthood, their children and so forth, some went into medical field and others leaders in their fields. And Augustin’s mother. She stayed with her daughters. I found mother’s death record listing 3 living daughters and son who is in “Amerika”. This was the critical breakthrough. My mother had an older sister Eleanor who died in 1920 at age 1 month, 17 days due to bronchitis/pneumonia. I grew up knowing about her and that she had a short life and that my grandmother would talk about her with sadness in her voice. I can’t imagine the worry as they welcomed my mother into the family 18 months later. When my mother died I made sure that Eleanor was listed in her obituary. My mother always said she thought her sister died due to whooping cough – that a family friend who had visited the new baby brought an older child who infected her – but that’s not what her death certificate says. I’m just grateful my grandparents didn’t give up on having a family! Oh Judy. These memories can be so hard. Just ran across a distant cousin the other day who had 11 children – only 3 of whom lived long enough to marry. But maybe the saddest is my aunt, uncle and first cousins that we grew up with. My aunt and uncle had 4 children – they buried them all. They had 4 grandchildren – they buried 3 of them. Now they all rest together side by side. I know they are happy there. My great grandmother died in the 1918 flu epidemic, leaving behind my 7 yr old grandmother and her two younger sisters. She was pregnant when she got sick, putting her into a higher risk category. Family lore says she was 7 mos pregnant with a boy, who was born prematurely shortly before his mother died. They are buried together, but there is no mention of him on the tombstone and no birth or death certificate in NJ where they lived. I find it very sad that so few of us around now know that this baby ever existed, since there doesn’t seem to be a record of him. Then it’ll be your job as the teller of the family tales to make sure there is a record for the future. There are two precious still borns, twins, brother and sister to my grandfather, that I hold dear. For it was these two, who I found in church records, named after an aunt and an uncle, that led me to my Norwegian Great Grandmother’s family in Stavanger, Norway. Without them, I’d still be searching. Good of them to lead you to the great grandmother’s family! In 1864 my Great Grandparents lost 3 children in one day: their 2-1/2 yr old first son, and twins that were either stillborn or died the same day! I can’t imagine losing 3 children like that. My mother told me it was “summer complaint” or diarrhea – usually caused by spoiled milk. Then they had my great aunt, and in April 1868 G-Grandfather was killed in a railroad accident when my G-Grandmother was 3 mos pregnant with my Grandfather. While partial to documenting as much as I can about the women, who usually get such short shrift in documents, I’m particularly partial to accounting for the little ones in our family lines who are so often overlooked. Thanks for sharing the story – it seems many of us are doing our best to ensure they are not forgotten. It’s sure our obligation to tell their stories. I love that you honored this child. We sadly run into so many of them as we do family research. When I was a little girl, I was bewildered by the many little children buried in the family rural cemetery. Later, I learned about some of them: a brother and two sisters, who were the children of my 2G granduncle John and Harriet (Ehle) Stewart, all died within one month. The sorrow so many of these families felt! Woodstock Sentinel, 29 Jan 1862￼: “DIED In Hebron, McHenry County, Ill., Dec 24 1861 of Diphtheria, KITTIE, aged 9 years and 2 months; also, January 9th, 1862, ROBBIE, aged 7 years and 3 months; also, January 20th, LIZZIE ADELIA, aged 2 years and 6 months, all children of John and Harriet Stewart.” If that wasn’t sad enough, another daughter, Ann, 8 years old, died of the same diphtheria a few years later. The better news is that they had other children who lived to adulthood and carried on the family name. All those losses… so sad. When Nehemiah Holt was called up to fight in the “French War” of 1754, he left his wife, Anna, and five healthy children standing at the door to their Connecticut home. When he returned a few months later, only Anna was there to greet him. All five of their children: Nehemiah (who was almost 8), Eliphalet (5), Jonathan (4), Sarah (2) and Nathaniel (6 months to the day after he was born), had died while he was gone, one in July, one in August, and three in September. Can you imagine how Anna must have felt, all alone, watching her babies die, one after another, and wondering if she would ever see her husband again. Can you imagine the shock for Nehemiah, and the pangs of guilt he must have suffered for having been absent when his family was suffering such distress. They went on to have six more children who survived to adulthood. I was lucky enough to know my first cousin John Harrison, for most of his life. He was the oldest child of my uncle Henry Harrison and his wife Marjory Driesbach. Just before his 10th birthday, on a clear winter Saturday, he went out by himself for a bike ride. When he returned, he told his parents that he’d fallen off, but didn’t hurt himself. They took a good look at him, and he seemed fine. By Sunday night, though, he was a bit feverish, and Monday morning he had a high fever. They immediately took him to the nearest hospital, where he was admitted, and died Tuesday morning of meningitis. It was Jan. 27, 1953. I remember my parents telling us that Johnnie’d died, of both a bike accident and meningitis, which I’d never heard of before. It didn’t make sense. They wouldn’t let us go to his funeral. A few years ago, I was searching local newspapers, looking for anything on the extended Harrison family, so I put in just the surname. Two articles with John’s name popped up. The first shocked me, as it strongly implied parental neglect because they didn’t take him to the hospital immediately. Because of this circumstance, the county coroner was legally required to do an autopsy. The second article, a couple of days later, said the coroner found no injuries; the meningitis was coincidental to the fall and the cause of death. Now the implication was that the parents were not to blame. But I felt such pain for what my aunt and uncle and Johnnie’s brothers must have gone through, along with other relatives like my parents and Johnnie’s grandparents. I think I’m glad I didn’t know at the time. Now I can continue to remember Johnnie as a 10 yr old to my 8 at the time, a tease with buck teeth who wore his crew cut just a bit long and slicked back, and loved that bike dearly. I don’t think it matters when, or how the child dies, but I can think of little else more painful for a parent. Wow… what an awful time for your family. The “Lost Children” of our family. My maternal grandmother had, according to my uncle’s birth certificate, 11 children. I have been at a loss to find them all. There was a large gap between the first and second child, and on the 1900 US Census, grandma is listed as having had 4 births and 3 living children. I found a mortuary record for a baby boy who was stillborn in 1903. There was a family story that Grandma had lost twin girls on the day of the great April 1906 earthquake in San Francisco. However, in 2006, cousins in Switzerland sent me a copy of a letter that grandma had written back to home in December 1906, stating that she had become ill in June, and lost her child shortly thereafter. So now there are three, the baby between 1893 and 1898; the baby boy in 1903, and the baby in 1906. So that accounts for 6 of the babies, 3 living children and 3 stillborns, or died at birth. My mother and her twin brother were born in 1908, and are listed as the 10th and 11th births. So that leaves 3 more. My mother told me many times that her mother had lost twin girls before she and her twin brother were born. And then there was one more. Mother often said that her mother had delivered a total of 12 babies. So perhaps another after my Mother and her twin? Grandma was 41 when they were born. I checked the baptismal records for the church where all the babies were baptized, but only the 5 living ones are registered. I also checked the records of another nearby church that the family later attended, but there were no baptisms for the family there. That says to me that the babies were probably stillborn. Interestingly, my mother’s brother was listed as a “Conditional” baptism. It seems he was sickly at birth, and they were afraid he might not live the night, so the Midwife baptized him. The conditional baptism by the priest was just in case the midwife had not baptized him correctly. One amusing thing about the birth of my mother and her twin is that one was born before midnight on August 2, and the other was born later, after midnight on August 3. The midwife changed my uncle’s birth time to 4:30 pm on August 2, so they would appear to be born the same day. But she forgot to change the birth order, and my mother was listed as number 10 and he as number 11, of grandma’s births. Because all the cemeteries in San Francisco were moved out of the city during the early 1900s to Colma, south of the city, there are no records of any of the babies’ burials, only the record of the baby boy in 1903. He was buried in one of the city cemeteries, and I don’t know if his body was moved or not. The next death in the family was in the early 1920s and at that time the family bought a plot in the Colma cemetery. None of grandma’s babies are listed in that plot. There is a place for babies where they were buried en masse from the old cemetery in the city, but there is no list of names. Good for you for trying so hard to document all of these babies. What a beautiful heart-felt story about the death of a baby and its brief life. It was good to read it in relation of the fate of the family and to think about it as a whole. Also good to see the comments flowing from this emotional story. Too often, when we come across a death of a baby in family research which as we know so common for our ancestors that we almost dismiss it, without thinking of how it fits into a family and its affects upon the future of that family. Thanks for sharing this story, has made me think. Your post prompted me to share, if I may? I’m the oldest of 6 siblings, but there was a 7th, who came right after me, who died at birth. James. I remember visiting his grave once as a child and he was never really discussed. While doing the family history, I found the records of the grave in the cemetery next door to the one the rest of the family is in but it’s old and unmarked and I’m never sure I actually found it. But I found a wonderful story. There were 3 people in that grave; our granduncle Patrick who died in 1921. His father (my gr-grandfather), in Ireland, bought the grave to bury his son in America. Another granduncle had a son (my 1st cousin 1x) who also died at birth in 1931. Then 25 years later was my brother. When he died, one of my grandmother’s people allowed us to use that plot, which was generous and a blessing. I’m so happy to say that I had a headstone for these 3 previously forgotten people installed on their grave last October. I did it just because they lived, they had family and now, in a small way, they are remembered and present in a way they weren’t before.